Aiming at improving the cooperation within the rail sector, the first WP 3 deliverable “Assessment of the current situation of cooperation within the rail sector” has now been published. It introduces the current situation as regards the rail sector in Europe and issues with cooperation within this sector, focussing on problems and bottlenecks as well as solutions and successes. The different stakeholders, their roles and the interrelations between the different actors are identified, analysed and pointed out. Special focus is on existing cooperation as well as on business and governance models currently in place. By examining cooperation models of other sectors including analysing their potential input to Smart-Rail the focus is extended beyond the rail sector. In addition, existing infrastructure, operative and regulatory bottlenecks as well as barriers in accessing the infrastructure and competitive barriers hindering cooperation are addressed. 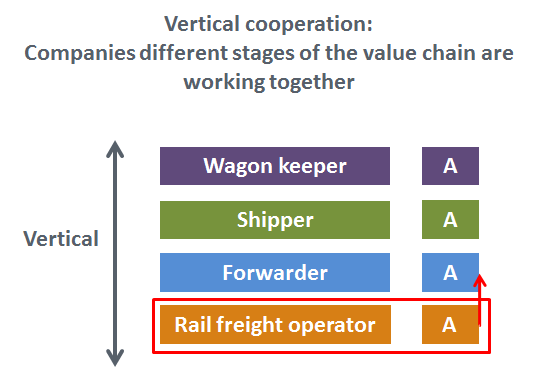 Cooperation agreements within the rail sector are established for different reasons. Like in other sectors, bridging the gap between different conflicting requirements of the market, competition, own strengths and weaknesses is often the determining factor and the initial reason for setting up cooperation. There is neither a fixed scope nor a fixed organisational form. Each cooperation is different from others. For this reason how to organise cooperation internally is the challenging question, tackled by the Smart-Rail project. In general horizontal and vertical cooperation can be distinguished. The focus of this deliverable is on horizontal cooperation and the experiences and conclusions that can be derived from them for developing new business and governance models aiming to promote cooperation in the rail sector. In principle horizontal cooperation are possible for all enterprises independent of their size, but are of particular importance for small and medium enterprises in the starting phase of their business activities. Their common general characteristic is the joint acting of weak partners to compete with stronger competitors. However history shows that the more strength the individual partner gains in the course of time the less important horizontal cooperation becomes up to it becomes unimportant. This is pointed out by examples of horizontal cooperation, established at the beginning of the liberalisation of the European railway market. Cooperation is not static but dynamic. Their development, not only for railways, can be described as natural process, evolving over time from an original entity to a complex entity. The more complex a horizontal cooperation is getting, the more changes in organisational structure as well as controlling and managing is required as corresponding structures emerge. From a certain point structure switches to a hierarchical i.e. vertical structure. Nowadays vertical cooperation, meeting the market requirement more sufficiently than horizontal, is more important. Although horizontal cooperation may have potential in new future markets. Irrespective of the cooperation form, the respective business and governance models are highly influenced by both internal and external factors. Without adequate framework conditions, equal for all actors involved cooperation will fail. Already now it becomes apparent that several hindering and conflicting factors on different levels exist. In addition to challenges regarding the optimal framework for cooperation it is important that although a part of the existing infrastructure and operative bottlenecks can be solved finally only by serious infrastructure investments, another part could be managed partly by appropriate measures and better cooperation among the affected stakeholders in the transport chain. 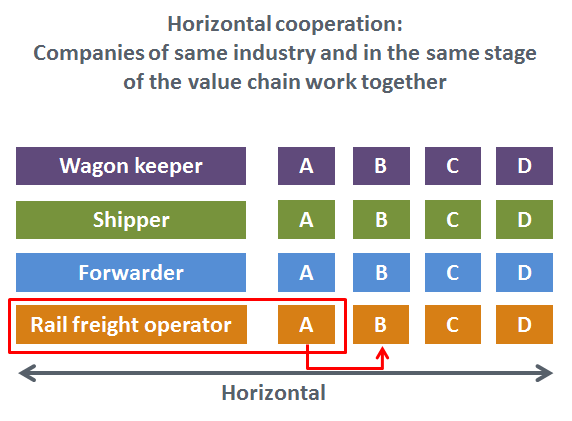 Considering the state of the art in cooperation in the rail sector, the short term opportunities should be found in markets suitable for cooperation to improve the performance of rail freight services, since the operative problems, which are mainly related to infrastructure, need a longer period and other resources to be solved.